The State’s demand for allocation of at least Rs 1,805 crore towards railway development in the 2010-11 Railway Budget has been ignored. It has got about Rs 836.64 crore as against Rs 715.22 crore for 2009-10. It would be spent for construction of new lines, gauge conversion, doubling and electrification. In addition, Rs 65.53 crore have been sanctioned for undertaking traffic facilities work at various stations located in the State. In total, the State has got Rs 902.17 crore. This includes Rs 430 crore for completion of the ongoing new lines and Rs 399.73 crore for doubling of the major rail tracks. The good news is that Rs 120 crore has been sanctioned for the Khurda- Balangir railway project, Rs 101 crore for Haridaspur-Paradeep, Rs 75 crore for Daitari-Bansapani and Rs 50 crore for Talcher-Bimalagarh project. In the Railway Budget for 2009-10 the State had asked for Rs 1,504 crore, but it was allocated only Rs 715 crore, of which only Rs 653.22 crore was released. The Budget has proposed to update the surveys for the Phulbari-Berhampur, Puri-Konark, Gunupur-Theruvali and Jeypore-Malkangiri rail routes. In addition, survey will be made for new train lines in the Talcher-Phulbani-Lanjigarh and Gunpur-Theruball-Junagarh-Jeypore routes. The only new line project that was included in the Budget is Digha-Jaleshwar. Railway Minister Mamata Banerjee has proposed to set up one of the State-of-the-art wagon factories in joint venture or public-private partnership (PPP) mode either at Bhubaneswar or Kalahandi. Similarly, for rail connectivity to the new minor ports coming up at Astranga, Chudamani and Gopalpur, the Railway Minister has proposed PPP mode. The following new lines are expected to be completed during the year 2009-10: Lanjigarh-Bhawanipatna portion of Lanjigarh-Junagarh line. 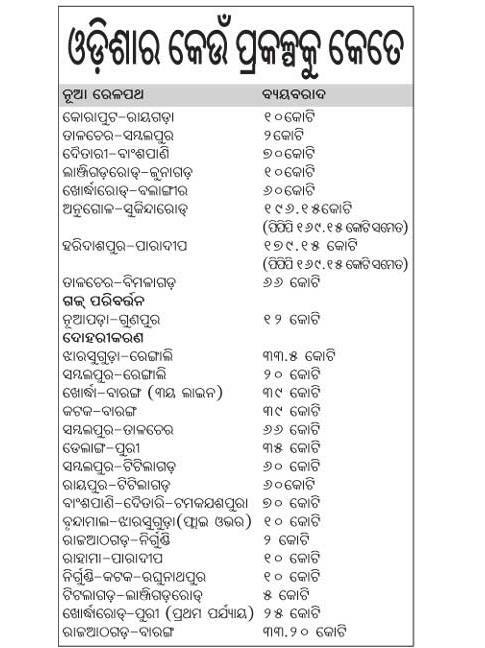 The following sections are expected to be completed in 2010-11: Bhawanipatna-Junagarh of Lanjigarh- Junargarh & Khurda-Begunia of Khurda-Bolangir. The Budget had made provisions of 10 Duronto trains in the Railway Budget 2010 including five for West Bengal while there will be one Duronto Express between Howrah and Puri. Out Patient Department (OPD) and diagnostic centres will be set up at Balugoan, Bhadrak, Bhubaneswar, Bramhapur, Jajpur-Keonjhar Road, Kantabhanji, Kesinga, Khurda Road, Koraput, Rayagada, Sambalpur, Titlagarh, Visakhapatnam and Vizianagaram stations. Secondary-level General Specialty Hospitals will be set at Bramhapur, Kantabanji, Koraput, Palasa, Rayagada & Visakhapatnam stations of the East Coast Railways.